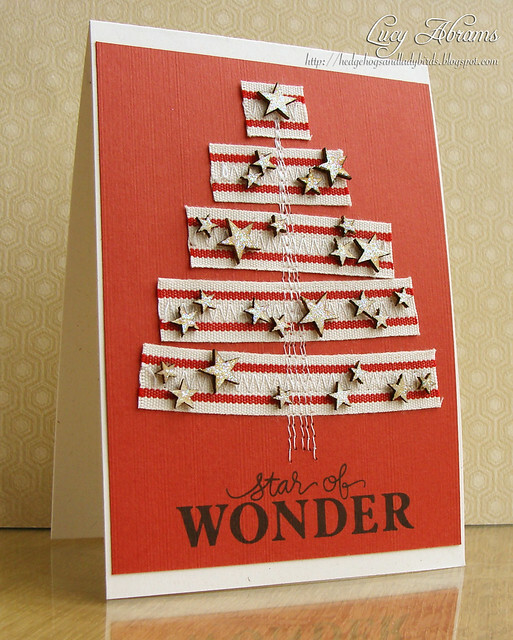 Lucy's Cards: Star of Wonder and a giveaway! Star of Wonder and a giveaway! Hi, I'm back with another card made using Simon Says Stamp's December card kit. For this card, I used some of the yummy ribbon from the kit to create a stitched ribbon tree, then added a sentiment from the stamp set. I embellished with some cute Studio Calico tiny wooden stars which I covered in Star Dust Stickles. Now, here's some exciting news. Just leave a comment here by Sunday night and I'll draw a winner next week. Great card - I love the added touch of the glitter on the stars. Wow...this is a very versatile design. I'm going to make note of it to use later. Thanks for sharing. LOVE your tree Lucy, what a brilliant idea! I never get the veneer packs because I think there are so many more in a pack than i can use! Problem solved! Fun stamp set too! What a lovely idea....I'd never have thought of using strips of ribbon to make a fabby tree like this....and I love the stars! Gorgeous creation, Lucy....and those stamps are beautiful...thanks for the chance! Awesome card! I LOVE that stamp set, thanks for the chance to win! Wow, love how you've used ribbon and stitching to create the tree! and gets smaller at the top! Love all your cards Lucy! Thanks for sharing and a chance to win! Another super COOL card! Love the added glitter and stitching! thanks so much for the chance to win this amazing set! I love your style. Your cards are simple yet classy! Awesome tree, love the stitched stem!! A gorgeous card and a great stamp to win. What a creative way to use this ribbon! I like the glittery stars too. Beautiful card! I love the tree made from ribbon & the veneer stars are a favorite. Thanks for the chance to win the great stamp. This is amazing!! I LOVE those wood stars.. Just love them!! Love how you used the stitching too!! And the stamps... just wonderful!!! Awesome card! Love the stars and the sentiment stamp Lucy. Thanks for a chance to win this generous giveaway, I always admire the stamps from Simon Says. Fun tree card! I love all that texture! love the dimensional stars on the card...added so much charm to it! This is gorgeous! I love the Stickles on the stars! I never would have thought to do that! Love your card! It's just amazing! Thank you for a chance to win this great stamp! Love it! You are very, very clever! Super inspiring! The ribbon and stitching are awesome. Love the stars! The card would be great for a fourth of july theme too. Another beautiful card using the SSS kit. Very inspiring thanks Lucy. What a great way to use some leftover ribbonpieces to make a tree. I love this idea, and´ll keep it in the back of my head for later use too. The Star or Wonder card is amazing. I'm going to try something similar now. Thanks for inspiring us and for the giveaway! What a great idea! Thanks for sharing and a chance to win! GORGEOUS card!! Thanks so much for a chance to win! What an awesome idea! Love the effect! Thanks for the inspiration. What an awesome idea. Love the effect and the card! Thanks for the inspiration. I think you could do something similar for 4th of july with a blue background instead of red. I love the stars with just the little bit of bling. Thanks for sharing the inspiration! This card is terrific. Love the sparkle on the stars, lovely touch. Cute card! Love your blog. Awesome card Lucy, as always! 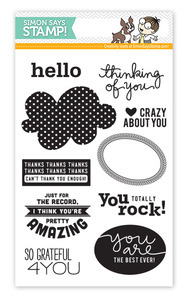 I am a big fan of all of Kristina's stamps and dies and WOULD be honored to add this set to my collection!! That would make a nice Gift! Thanks for the fun offer!! I love your tree of stars! Great christmas card...love the use of wooden stars. Thanks for the chance to win this great stamp set. Just love your card!! Stars of wonder! And I'll be holding thumbs for that stamp set. First, I LOVE your cards! I don't think I've seen one that I don't like. Second, THANKS for the giveaway! Cool set! I love your cards Lucy. 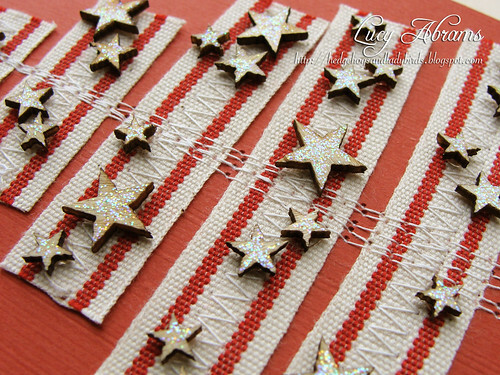 This one is one of my favorites, it looks very Americana :)...I'm in love with those adorable stars. I love your ribbon tree! Thanks for the chance to win the stamps! Aren't the wooden embellishments fun? Thanks for chance to win the prize. Love your card! What a great idea with the stitching and stars that sparkle! Thanks for the chance to win, too! Love the card, especially the glittery stars. Thanks for the chance to win! Love that ribbon tree with those tiny stars! Thanks so much for a chance to win those fun stamps. What an awesome card!! I love it! And thank you for the chance to win!! Love it! We are doing a torn paper tree card with kids at my local museum next Saturday but your's is much lovelier!